Sure Crystal Deodorant (Travel Size), £1.57 for full size - I always find that travel size deodorants last about a week which is obviously no good if I'm away for longer than that! However, this one seems to have lasted me a few trips away and this is my go-to deodorant anyway. 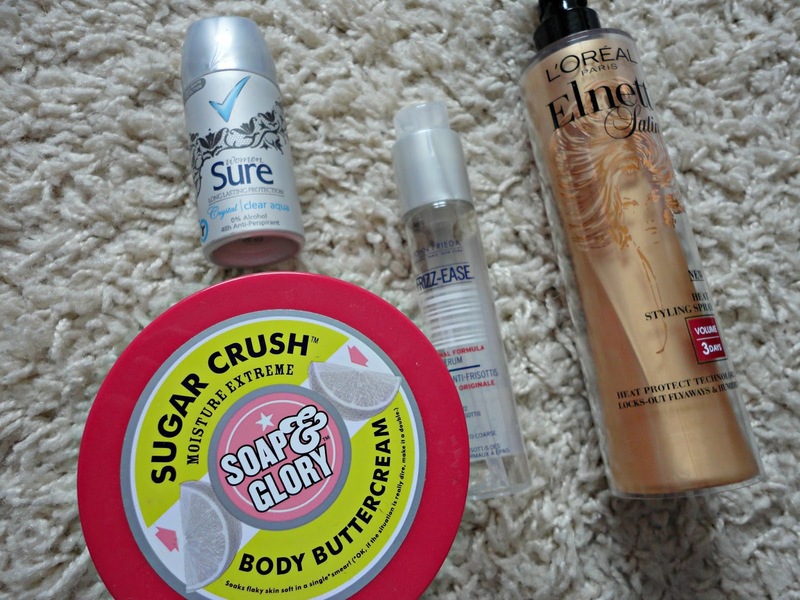 Soap & Glory Sugar Crush Body Buttercream, £10.50 - This is my second tub of this and it's definitely my favourite body butter from Soap & Glory. The scent is just gorgeous - a fresh citrus/sugar scent which is perfect for summer. It is a bit pricey at £10.50 but you get A LOT of product which will last you 2 months+. I haven't repurchased yet as I'm using up some other body lotions etc but when I get the chance, this will be back in my possession! John Frieda Frizz Ease Serum, £6.29 - I naturally have very wavy/curly hair which is prone to frizz - such a pain! This has been my go-to hair serum for years. It's one of those products where you really notice a difference when you don't use it. I repurchased this literally as soon as I finished this bottle and I can't recommend it enough! The best high street hair serum I've found. L'Oreal Elnett Styling Spray (Volume), £5.99 - This is the fourth empties post in the last 7 months that this has featured in! It's probably one of the only products I repurchase time and time again as I really find it works wonders! I tried out a lot of heat protectants but this is the best one I've found - it smells really nice and I genuinely do find that it keeps volume in my hair for longer. Plus, the easy spray bottle is a lot lighter than using tons of hairspray! Despite it featuring in so many of my empties, it does last a long time, a month and a half with frequent use is my guideline. I will definitely be repurchasing this as soon as I can find it! Have you tried their foot and hand cream? My hair can get a bit crazy during the summer as well. I think I may have to look into that product!